When I was about 9, my neighbor friend and I decided to have a mini carnival in our backyard. I’m sure we thought of lots of fun, youthful things to do, but the only activity I really remember is bobbing for Tootsie Rolls. 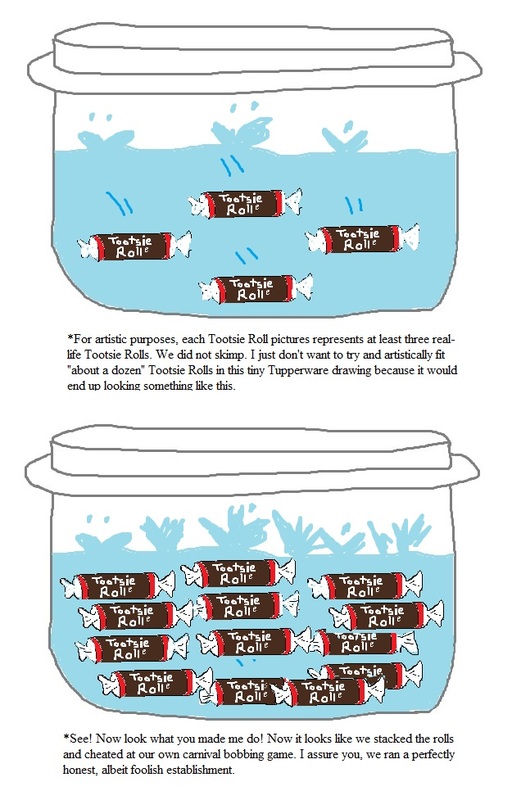 We wanted to do something like bobbing for apples, but what sort of kid wants an apple when they can have delicious semi-chocolately Tootsie Rolls instead? So at the start of the carnival (which lasted about 15 minutes), we filled a medium-sized Tupperware with water, and dumped about a dozen Tootsie Rolls in it. 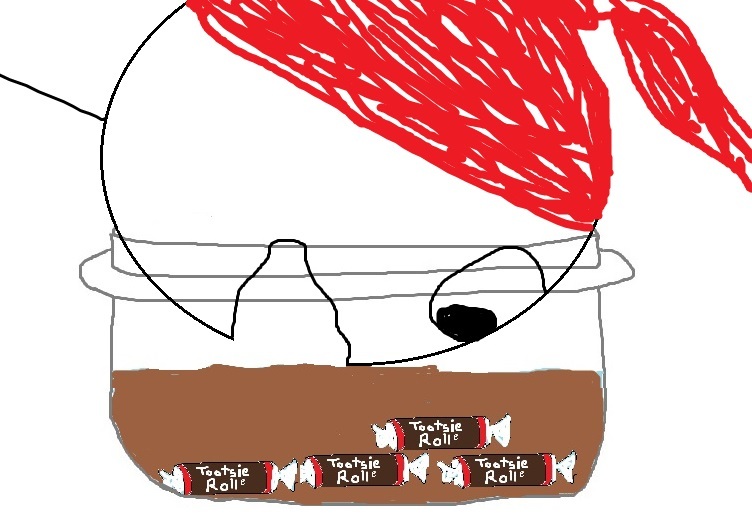 By the time we got to the Bobbing for Tootsie Rolls station, we had a problem and didn’t want to admit it. And the Tupperware was not actually big enough to get your face inside of. And the Tootsie Roll wrappers would disintegrate if you poked them around with your tongue trying to get them out. Okay, we actually cared about this one, it was gross. Thanks to the shredded wrappers but also to all the saliva that came about from trying to scoop up Tootsie Rolls with our tongues. We ended up just fishing out the Tootsie Rolls with our hands and eating them, but they were all gross and watery. Looking back, I am at least grateful we didn’t try mixing the chocolate and fruity Tootsie Rolls. That would have been barf-inducing. Also, I’m pretty sure I got the Tootsie Rolls from my mother, and I can’t help but wonder if she knew what we were doing and that it was a bad idea and that it would probably be very funny to watch.